Communion is a reminder of why we belong at the Father's Table of grace. Going a little farther, he fell to the ground and prayed that if possible the hour might pass from him. “Abba, Father,” he said, “everything is possible for you. Take this cup from me. Yet not what I will, but what you will” (Mark 14:35-36). It was now about noon, and darkness came over the whole land until three in the afternoon, for the sun stopped shining. And the curtain of the temple was torn in two. Jesus called out with a loud voice, “Father, into your hands I commit my spirit.” When he had said this, he breathed his last (Luke 23:44-46). The cross was intensely personal for Jesus. Not only was the cross Jesus endured an instrument intended to torture and humiliate him, but also it was the opportunity for all who opposed him, loathed him, and wanted him dead, to have their way. The crucifixion of Jesus was the moment when darkness reigned (Luke 22:53) and when Satan had his way at the expense of Jesus. Or so it all appeared. Little did Satan realize that this moment of darkness and humiliation that fell upon the Son would be the undoing of the power he held over sin and death (John 12:31; John 14:30; John 16:11; Hebrews 2:14-15). The love of the Son for the Father, along with his love for us, led him to go to the cross. This sacrificial love became for us Jesus’ triumphant love. His obedience to the Father’s will allowed him to disarm all the spiritual powers arrayed against us (Colossians 2:13-15). Far from being a spectacle of the demons’ glee, Jesus’ love made it the spectacle of defeat for every power aligned with evil and the evil one. The battle, however, was won before the arrest, false trials, mockery, ridicule, and abuse ever begun. The battle was won when Jesus chose the Father’s will over his own. That was not just because Jesus endured the cross, scorning its shame (Hebrews 12:1-2). It was personal because he had gone to the Father with the most intimate, tender, and dependent terms, asking to be spared the cross. 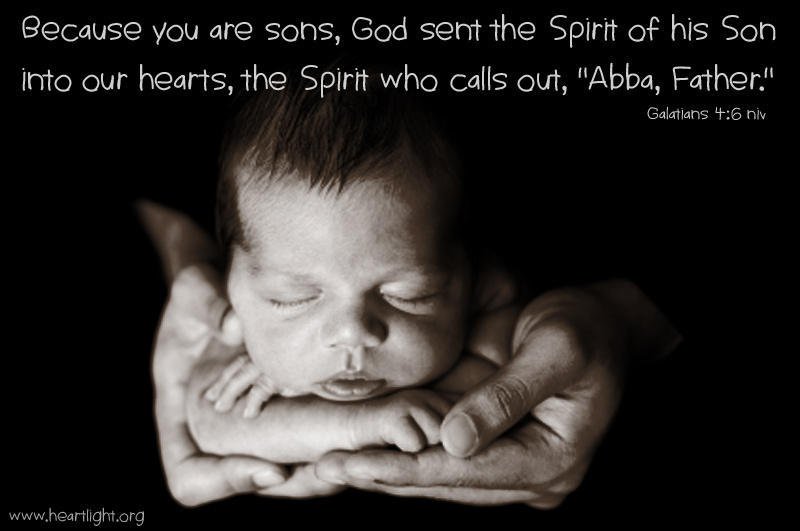 Jesus addressed the almighty God as “Abba Father”! He used the intimate, tender, and dependent term of a young child calling out to a father. Ab-ba are two of the first syllables many children make. Jesus approached his Father as intimately and tenderly as he could in a moment of deepest need. He expressed his dependence upon the Father as he sought relief from his impending crucifixion. What would the Son of Man choose? What would Jesus do with all his power in the face of such an abuse of power? What would the Christ, the Messiah, and hope of Israel, do in the face of utter and degrading shame? He would trust in his “Abba’s” will. He would accept what “Abba” had planned rather than choosing to do his will. He would do it to honor his Father. He would do it because of his love for us. For those who are led by the Spirit of God are the children of God. The Spirit you received does not make you slaves, so that you live in fear again; rather, the Spirit you received brought about your adoption to sonship. 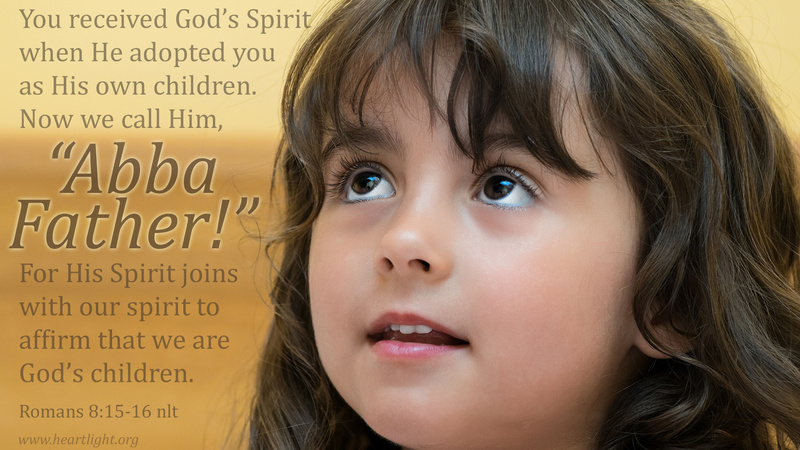 And by him we cry, “Abba, Father.” The Spirit himself testifies with our spirit that we are God’s children (Romans 8:14-16). On this weekend, many of us think of our Fathers — for some of us, good fathers, for others of us, not so good ones. Because of Jesus, we all come to our Father’s Table, the Eucharist, our table of blessing (1 Corinthians 10:16), with confidence (Ephesians 3:12; Hebrews 4:16). We come to The Table as God's beloved children! We don’t come as strangers. We don’t come as degenerate sinners. We don’t come as those unholy, unworthy, or unforgiven to The Table of grace. We come to our “Abba’s” table to be presented to our Father by Jesus as those who are “holy in his sight, without blemish and free from accusation” (Colossians 1:22). We come as the Father’s beloved children (Ephesians 5:1). We are welcome because our oldest brother, Jesus, has paved the way for us to be here (Hebrews 2:10-15). His body was given so that we could be included. His blood was shed so that we could be adopted (Romans 8:15; Ephesians 1:4-10). He was raised so that we could be reborn into the forever family of God’s love. The cross is also intensely personal for us. It means that what we share in Holy Communion today is beyond bread and wine: we share a meal with family. We share a meal with our older brother who paved the way for us to be a part of this family. We are joined by our “Abba Father” who now welcomes us. We share this meal as a foretaste of home and a forever grace yet to be fully experienced in the presence of our “Abba Father”! O dear Abba, adequate words fail me. My heart wells up with deep thankfulness. Your love, your plan, your grace, your cost, and your gifts have brought me new life in your family of grace. I regret the cost but relish the grace. Thank you for being my ”Abba Father” a gift you have given me through the sacrifice of Jesus for me and the gift of the Holy Spirit within me. Amen. Almighty God, my precious Father, just as my body depends upon blood for its life, so also did my hope to be your child depend upon the blood of Jesus to bring me adoption into your family. Thank you, God — Father, Son, and Spirit — and I offer this thanks to you, dear Father, in the name of Jesus the Son and through the intercession of the Holy Spirit. Amen. Special thanks to Free Bible Images and The Lumo Project for the free use of these images. 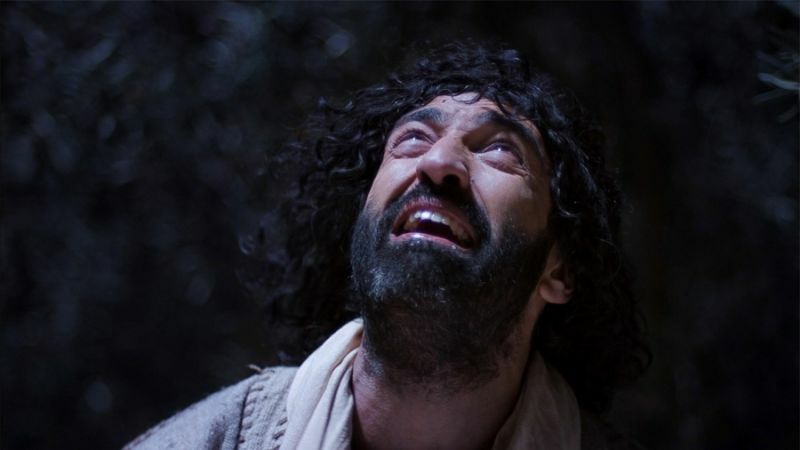 The Jesus videos from the Lumo Project are outstanding! "Dinner with Abba" by Phil Ware is licensed under a Creative Commons License. Heartlight encourages you to share this material with others in church bulletins, personal emails, and other non-commercial uses. Please see our Usage Guidelines for more information.